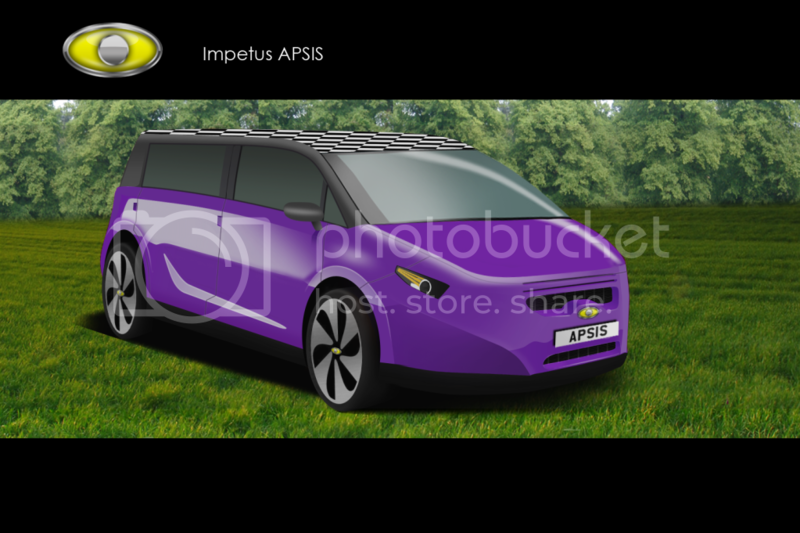 The Impetus brand is designed to compete with mainstream offerings from Vauxhall, Ford, Renault, PSA, VW and others, and has a history of producing interesting and stylish alternatives to these rivals. 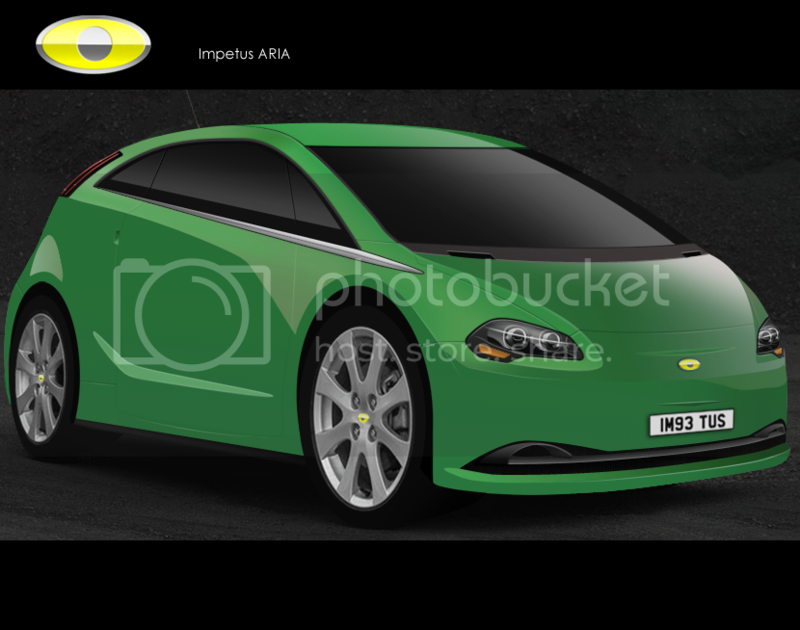 As well as selling a number of hatchbacks, Impetus also prides itself on sporty cars like the Aria V180 and the range-topping Piranha muscle car. 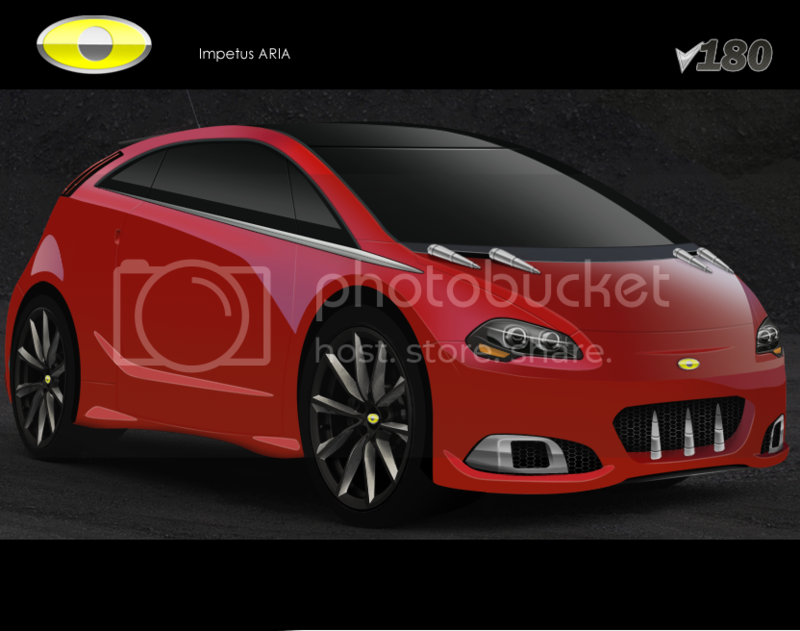 The Aria is Impetus' first foray into the European supermini market. And what an entrance! With its tall yet sporty shape, it has plenty of kerbside appeal but does not sacrifice on space for 5 adult passengers. The slippery shape and lightweight construction help to give this car a figure of just 105 g/km of CO2 in some models. The XSR model injects some excitement into the Aria lineup and provides most of the thrills of the range topping V180 for a lot less money. One thing Impetus really lacked compared with it's rivals was a dedicated sports-orientated line of vehicles. This short-coming is now rectified with the introduction of the 'V' line of vehicles. As you would expect, the '180' suffix references the 180bhp output from the car's naturally-aspirated 1.8l engine. This means that it takes less than 7 seconds to reach 62mph from rest, and can reach a top speed of 145mph. Of course, it is not just in numbers and figures where the Aria V180 excells. Uprated springs mean the V180 corners with finesse. But this is no track-day special. The hatchback practicality and comfortable ride both mean the car is perfectly usable day-to-day. 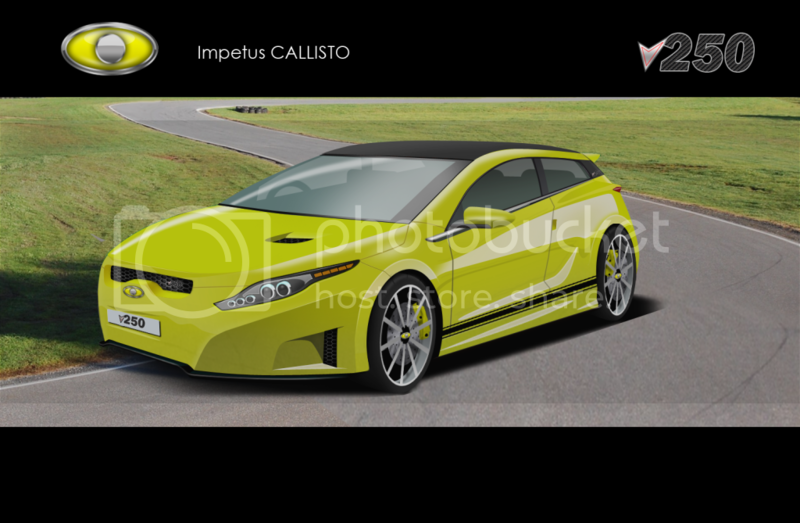 This family hatch builds on the success of the last generation of Impetus Callisto, and impresses with its distinctive shape and dynamic handling. 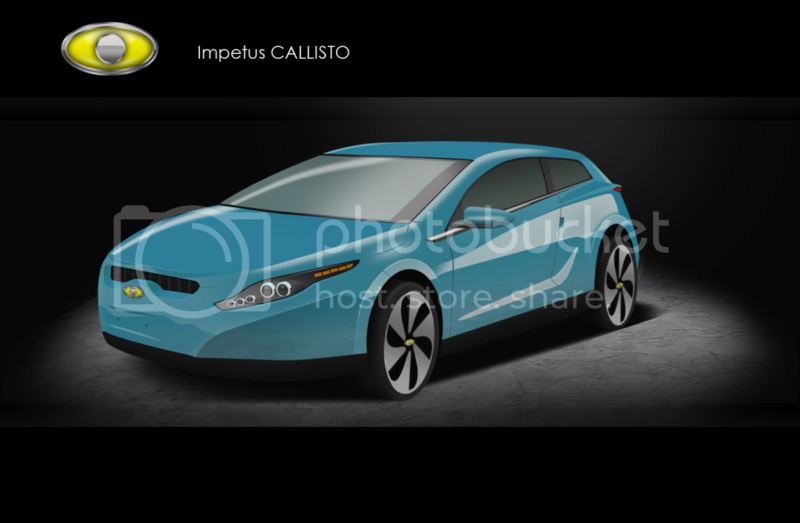 Much attention has been paid towards air-flow and the Callisto has best-in-class aerodynamics. This means that the Callisto has low wind-noise and uses less fuel than competitors. The V250 is the high-performance version of the C-segment Impetus Callisto. 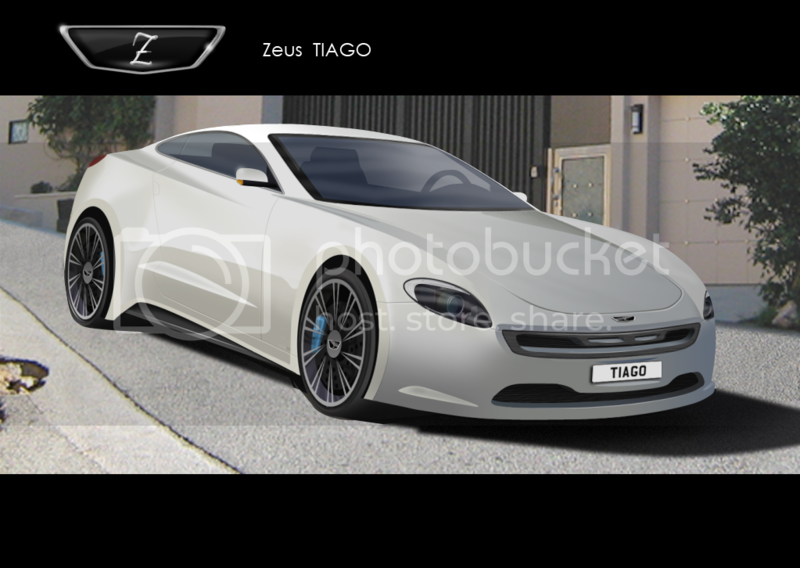 Just facelifted for 2012, the Cygnus is a 5 door hatchback with an evocative swooping fastback style. The front end sports Impetus' new corporate grill and sleek wrap-around headlamps. Somewhat refreshingly, it goes against the tide in sacrificing driver enjoyment for comfort and practicality, rather than becoming another 'sports-saloon'. Even with the enormous wheels available on top-spec models, it still has an exceptionally smooth ride, due to adjustable hydraulic suspension similar in theory to Citroen's big-car set-up. The Apsis’ futuristic styling is sure to gather attention. With its sharp lines and aggressive fascia, this car is unmistakably Impetus. The boxy shape hides a spacious and funky interior. There is ample room for 5 passengers and the rear seats fold completely flat, leaving a massive loading area for anything from sofas to surf boards. Personalisation is a key factor in the appeal of the Impetus Apsis. It come in a wide range of standard colours, and comes as standard with either a body-coloured roof or a black roof. A checkered roof or a Union Jack can be had as optional extras. 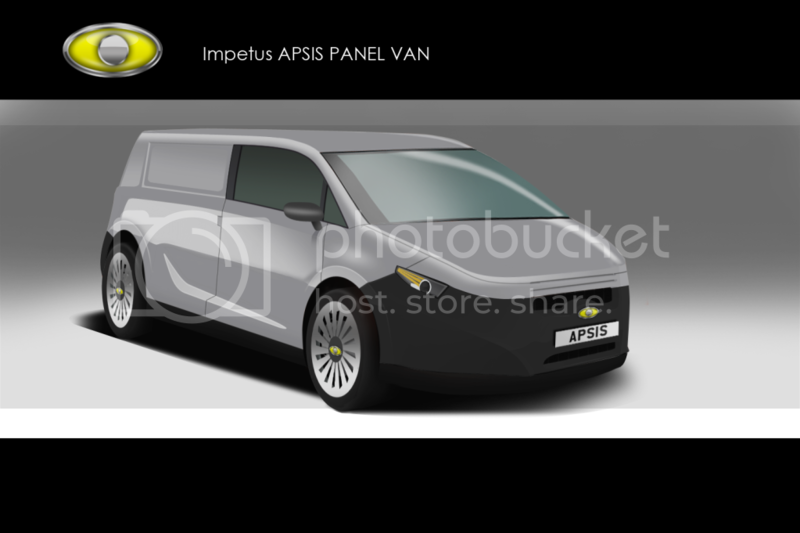 Also available in commercial Panel Van configuration, which carries loads of up to 850kg. 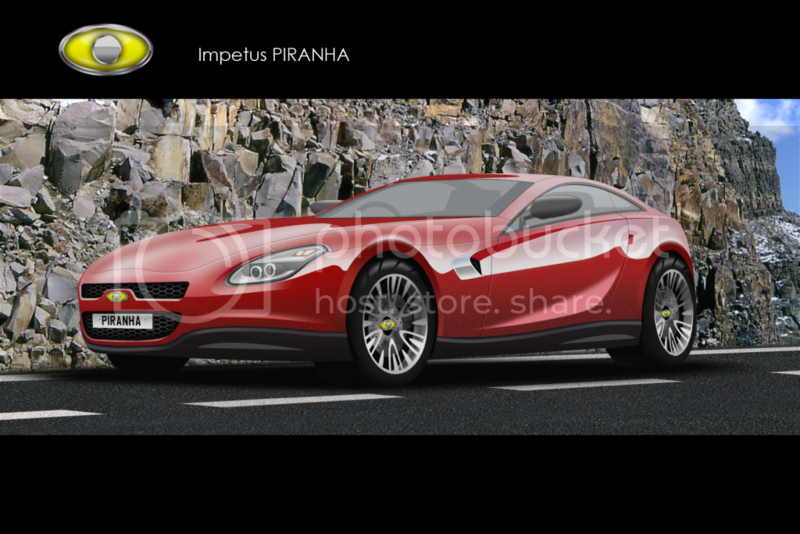 The Piranha gives Impetus a competitor in the sports coupe market. Sized and priced like a Chevy Camaro but with the performance of a Corvette. With 430BHP on tap through the rear wheels, a new set of tyres is just a stones throw away. The simplicity is reminiscent of muscle cars of old. However, Impetus has chosen not to go down the 'retro' route that Ford and Chevrolet have taken, and go with a rather more modern look. The extreme cab-rearward proportions and curvy shape both make this a car which attracts attention like nothing else in the price-range. 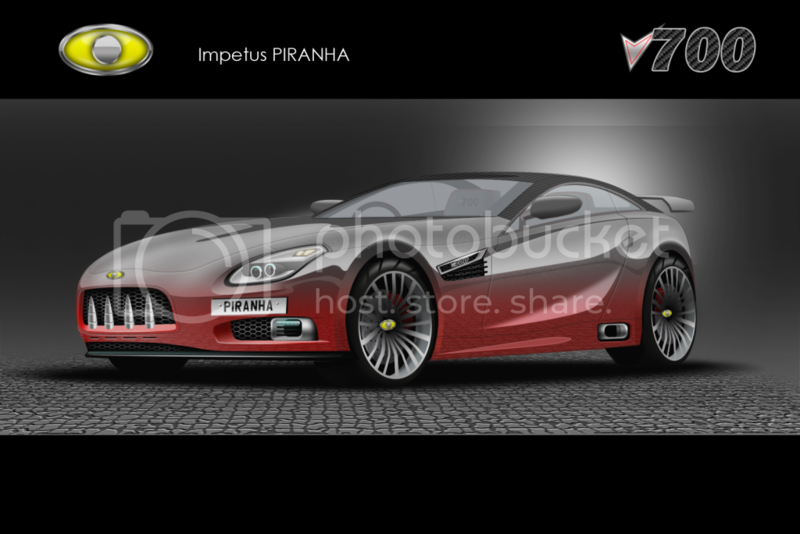 Impetus' flagship car is the Impetus Piranha V700. Like the standard Piranha, it is a rear-drive sports coupe. However, the V700 has a total of 700BHP. And the car's aesthetics reflect this. The front is dominated by a wide open 'mouth' which is adorned with 4 chrome teeth. The carbon fibre roof, rear spoiler and side exit exhaust all hint at the car's track-bred performance. However, this car is not for the faint-hearted. The powerful engine, combined with the rear-drive chassis can make the V700 something of a handful. Luckily, extra-wide rear tyres come as standard on this modern-day muscle car. The AC Group's upmarket branch, Zeus, was introduced in 2008 in an effort to appeal to a the burgeoning luxury car market in China. The AC Group has promised to develop the Zeus brand further into the future, with updates to their current models as well as all-new models. The new Tiago shows that the marque is capable of producing a luxury GT that can give Aston Martins and Maseratis a run for their money. 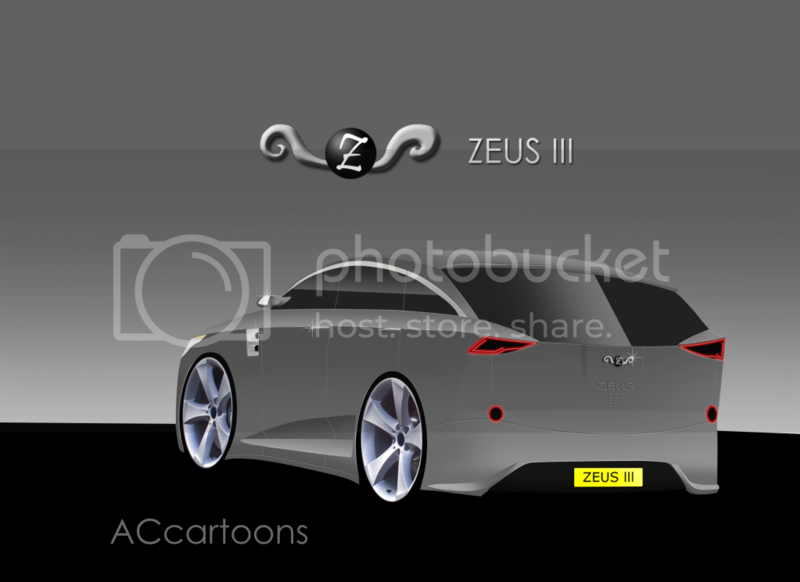 The Zeus III is Zeus' assault on the luxury C-segment. Being rear-wheel drive, it is both more entertaining to drive than an Audi A3, and more elegant to look at than BMW's 1-series. The III's range-topping 250BHP is seen elsewhere, in both the IV and also in the 'Impetus' AC Group divisions. The car's RWD platform is shared with the Piranha, albeit cut to a more managable length of 4.2m. 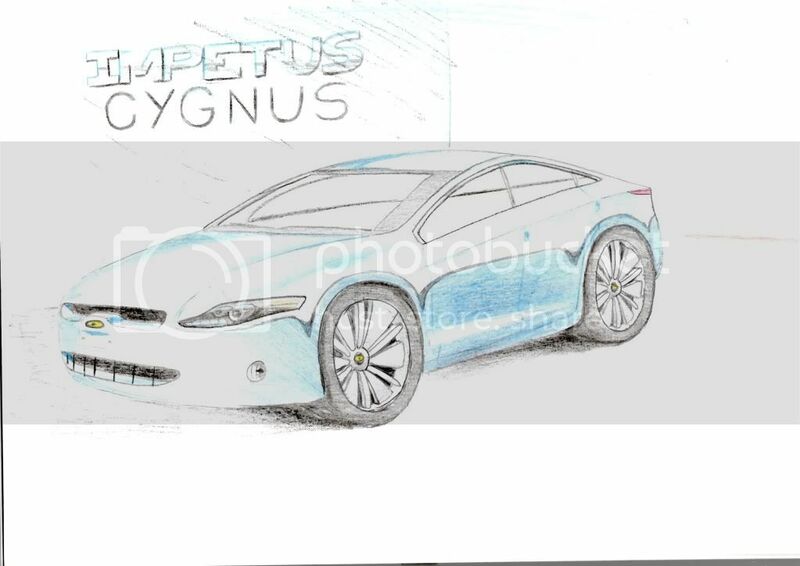 Rumours of an "AZ Tech" version of Zeus's smallest model circulating through the European and North American media have been put to an end by Zeus's CEO, who claims that there simply isn't a market for a ridiculously-powered car with this car's modest footprint. The majestic Zeus IV splits the gap in both price and size between the 3-series and 5-series. 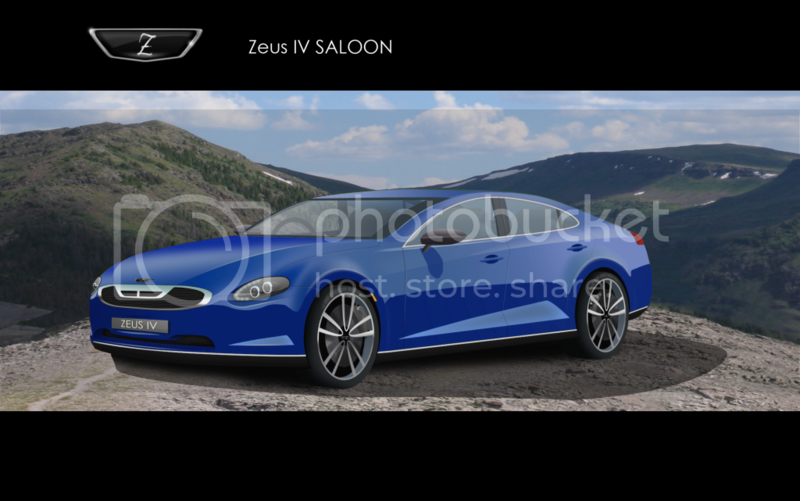 The saloon's coupe-like bodystyle is both elegant and sporty, and the wagon model is suited to buyers who require greater practicality. The smaller brother to the Zeus Tiago and rival to the Audi TT and A5. 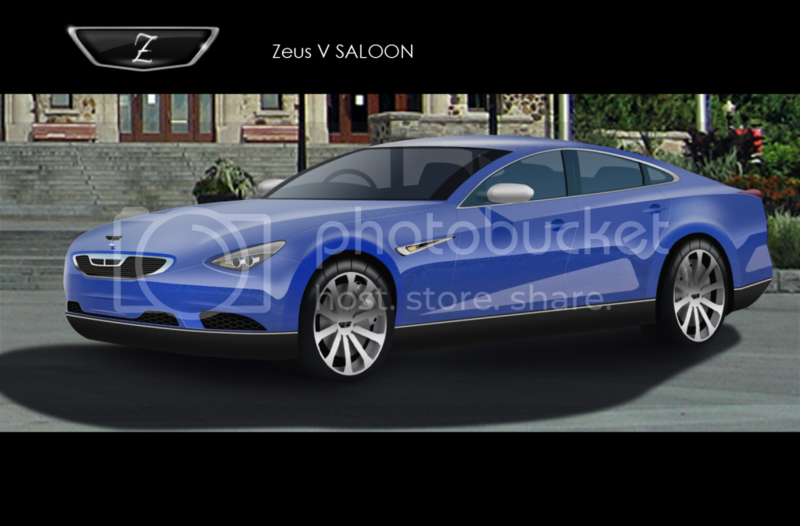 The platform and a lot of the styling is shared with the replacement to the Zeus IV which will make an appearance later this year. 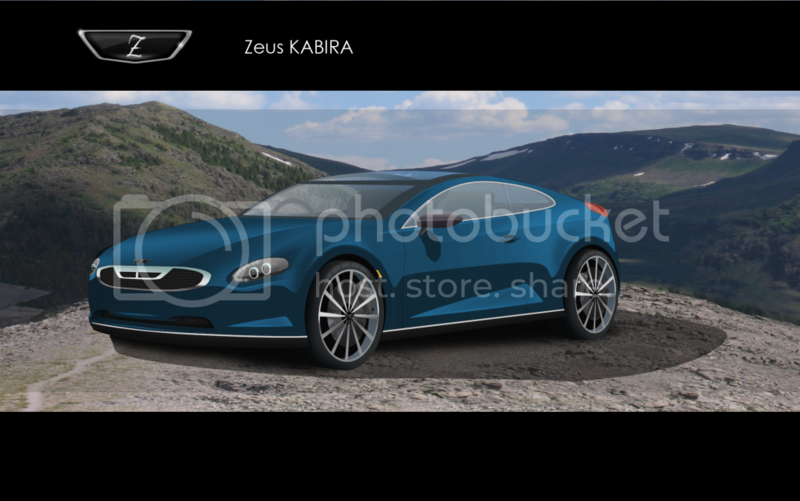 The styling to this coupe is influenced heavily by 50s GT cars from Aston Martin, Jensen and Lancia, among other makes. While only a 2-seater, practical considerations have been made in the form of a hatchback which opens up to a cavernous storage space. Most of the interior is lifted straight from the Zeus IV, and is equipped to a high-standard expected of Zeus models. 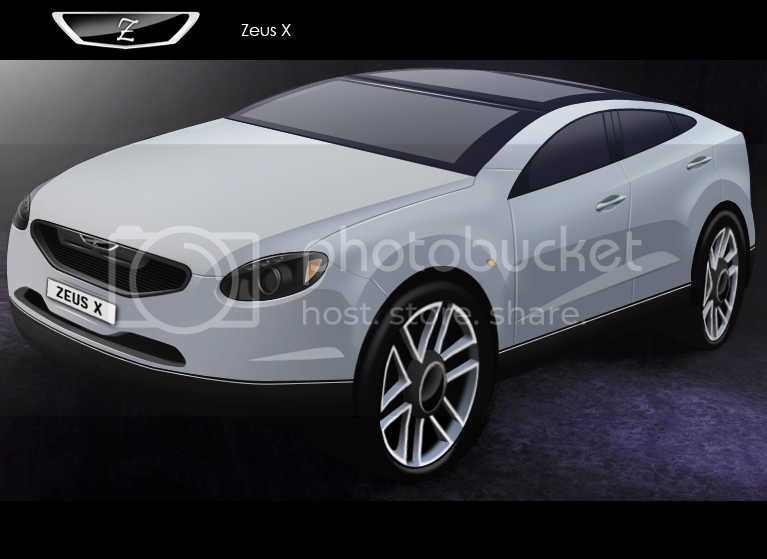 The Zeus X is not your average SUV. The X is a powerful, stylish, luxurious, emotive coupe-crossover. The X chooses to form its own path rather than striving for conformity like its German peers. As with the Tiago, the X aesthetics are smart and understated rather than bold and flashy. In profile, the vehicle's coupe-like fastback hints at the vehicles performance credentials. 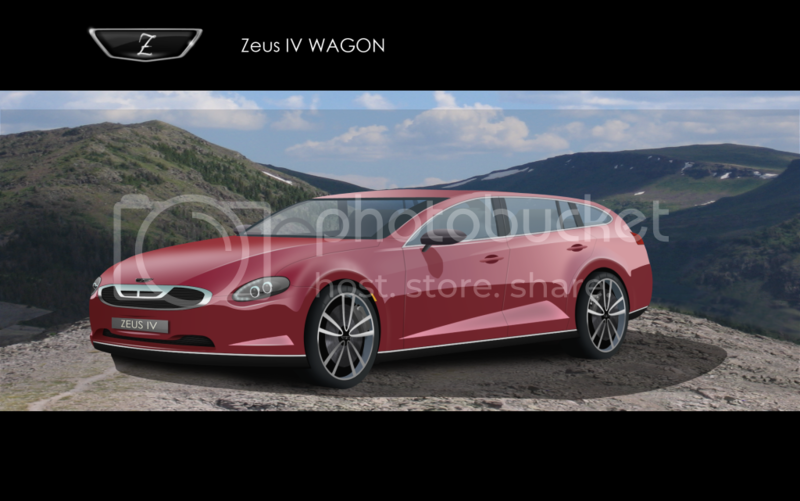 Bigger brother to the IV, the V tops off Zeus' range of 4-door cars. The AC Group's exotic sportscar brand is Sagitta Motors. With a range consisting of two models, thus far, Sagitta Motors produces cars that, while lacking in the heritage of Italian rivals, will give Ferrari a middle finger when shown a race track of any variety. 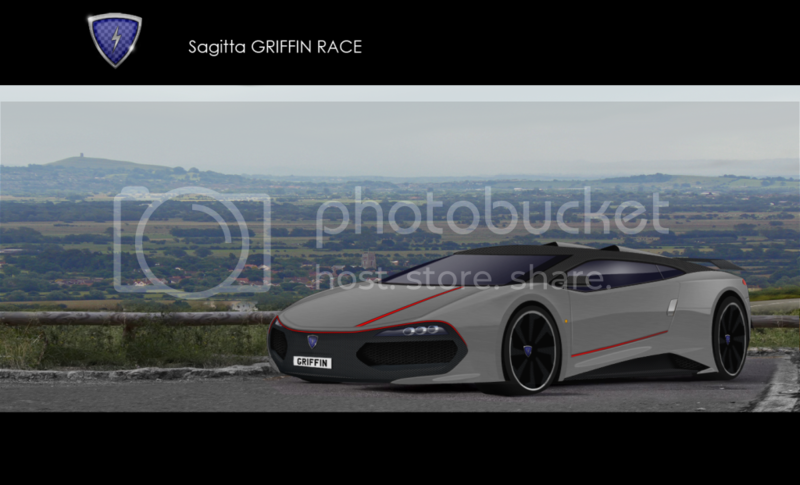 Sagitta Motors first sent the Italians into panic mode when they introduced the Blitz hypercar in 2010, now the Griffin is completing the picture. Ferrari, Lamborghini and Porsche no longer hold a monopoly on the supercar market. The first Griffin had its work cut out fending off competition in the form of Lamborghini's Gallardo, Porsche's 911 Turbo, and Audi's R8 V10. 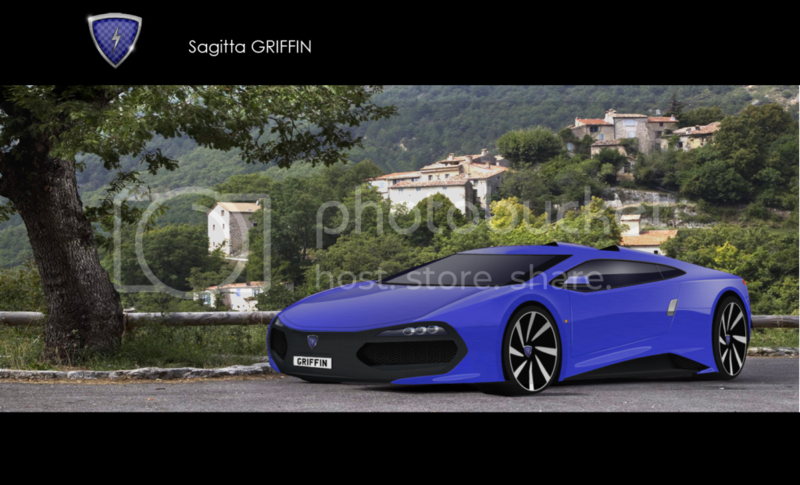 Yet In the face of new rivals from Ferrari, Mercedes and McLaren, Sagitta has upped the ante with its second generation Griffin. This one picks up where the last one left off, with a 560BHP 5.0l V8 lying in the centre of its compact platform. While this only represents a 10BHP increase in power from the first-gen Griffin, the 200KG saving in weight, and aerodynamic improvements will make sure it can perform at least as well as its immediate rivals. Inspired by Le Mans prototype endurance cars, the RACE has raised the bar in terms of providing a race car-like driving experience for the road. Extensive chassis modifications have taken place under the car, with many existing parts being replaced with new, lightweight carbon-fibre ones. Compared with the already lightweight Griffin 560, the mass of the Sagitta Griffin RACE has been lowered by 100kg. The RACE is the most powerful Griffin yet. The 5.0l engine generates 580bhp, and allows it to reach a top speed in excess of 200mph. The modifications to the engine help provides breathtaking performance whether on the road or at the track, and keeps up Sagitta’s reputation as a maker of uncompromising track machines. The experience is absolutely astonishing. 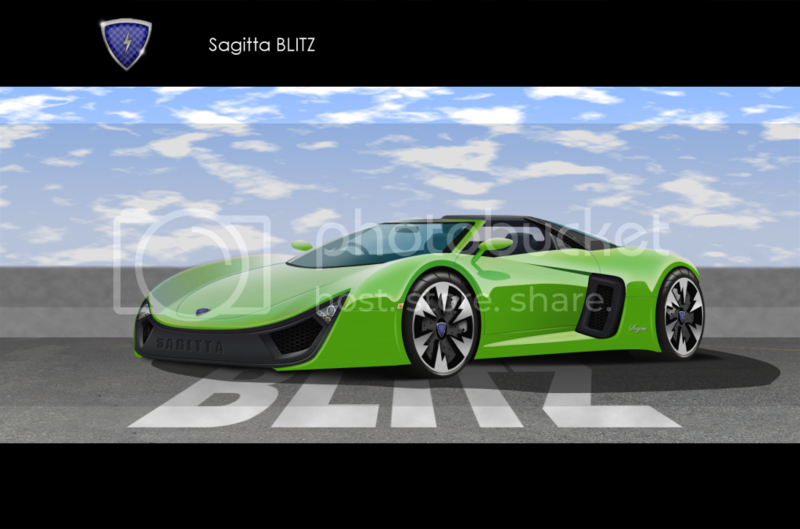 When the Blitz joined Sagitta's lineup in 2008, it was proclaimed one of the supercar elite. This mk ii model, with it's ferocious bellowing V12 and rakish targa body, is easy to spot from a mile away! The shape is bulbous yet athletic-looking, and the pointed front-end is sure to garner plenty of attention from passers-by. The £400k price tag and limited production run ensure that this supercar remains exclusive and sought-after. 230mph is this car's top speed, which puts the Sagitta Blitz right up their with names likes Lamborghini and Ferrari. Last edited by TheSwageLine; 12-24-2013 at 12:06 PM. Love the designs AC. Just one problem. Your badge for the Mabilis is exactly the same as the badge for my comapny Safrane Auto. But since I'm thinking about changing the badge, you can keep it. I'm going to try to update my three brands more often now (yes, that's three. I decided that there really was no need to have ACdesign, as all the markets that ACdesign competed in could be covered by one of the other three brands.) So expect to see more from Impetus, Zeus and SDB in future. Seen most of these before, but they still look great, AC! I remember when you and I were still doing chops with MS Paint! I now have a folder where I keep all my designs. Now that I've left school for a few months, I might be able to get to work on rendering some of these designs in Photoshop. It's hard for me to really get going with a project, but once I've started I find it hard to stop. I'm looking forward to seeing em!